Curious about one of the most sought-after trends in men’s jewelry and wedding bands? Spinner rings are one of the most recent fashion crazes to take the jewelry world by storm, and they show no signs of slowing down. Regarded for their brain fitness benefits and visual appeal, these spinning rings also provide a stylish option for masculine men who may not be accustomed to wearing jewelry. 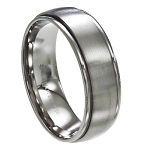 Although they are popularly used in various cultures in a spiritual context for prayer, these innovative rings are also an excellent choice for grooms who want their wedding rings to be as unique as their relationships. Whether you are looking to make the ultimate fashion statement or a calming way to fidget with your hands throughout the day, join us to discover what sets these rings apart from traditional betrothal rings, how they originated, and how to choose the best style for you. Also known as meditation rings, worry rings, or prayer rings, spinner rings typically feature an inner band that is set inside an outer band to allow one band to spin freely around the other. They also often feature intricate interior artwork to give them a more authentic appearance and greater visual depth. The interior band fits securely on your finger while the exterior band can be rotated for hours of soothing, repetitive revolutions. Meditation rings stem from the ancient religion of Buddhism. Tibetan Buddhist monks often used spinning cylinders of metal with sacred text engravings, called “wheel prayers,” to perform various religious customs and rituals. The spinning motion is believed to help calm the mind while simultaneously increasing opportunities for beneficial cause and effect, or good karma, and decreasing negative energies, also known as bad karma. Modern prayer rings are crafted from durable materials and typically handcrafted by skilled artisans to create a visually stunning spin. 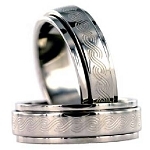 Some rings may feature laser-etched versions of well-known prayers while others may feature geometric design patterns. These fashionable rings are available in a wide variety of both precious and contemporary metals, ranging from tungsten carbide to stainless steel and sterling silver to ceramic. Finishes also vary, allowing you to choose from antiqued, faceted, traditional polishes with a lot of sheen, or anything in between. You can easily find your new favorite accessory or the perfect wedding band by exploring our spinner ring selection today. 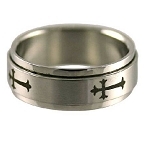 Each of the rings we offer can provide rugged style for any fashionable man. Best of all, JustMensRings.com offers a 30-day guarantee behind every ring shown, and we are confident that you will find the right choice for your needs and individual sense of style.